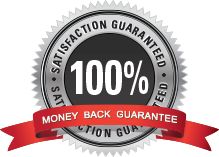 We offer the finest learning guarantee in our industry: Free after-class support for all students, guaranteed satisfaction with a Money Back Guarantee, and even a free Refresher class if you need it. We pride ourselves on getting things right. That doesn’t mean we’re perfect, but when we make mistakes we fix them. If you’re not happy with your class let us know and, at our discretion, we’ll provide you with a course credit or refund your course fees. be purchased separately at your discretion.